Be the first to share your favorite memory, photo or story of Colon . This memorial page is dedicated for family, friends and future generations to celebrate the life of their loved one. 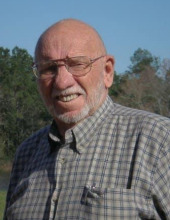 Colon Edward Berry, 86, of Lumberton (Pistol Ridge Community), passed away Sunday, November 18, 2018 at Forrest General Hospital. He was born November 10, 1932 to William Lawrence and Isabelle Swilley Berry. In his lifetime, he only held three (3) jobs, where he retired from all three. They were Kaiser Aluminum in Chalmette, LA (15 years), Hudson Salvage (30 years) and Forrest County District 5 Road Foreman (8 years). He was a member of Elder Ridge Baptist Church. In addition to his parents, he was preceded in death by his two brothers, James Howard Berry and William LaRay Berry. He was an amazing man, a wonderful husband, father, grandfather, uncle and friend and loved by many. Family members include Merle Wainwright Berry, his wife of 63 years, two daughters Lynne (Jim) Ladner and Nancy (Kelly) Davis, one son Colon Berry, Jr., all of the Pistol Ridge Community. Five granddaughter, Donna (Robbie) Lee, Ronda Woods, Denise (Chance) Peavy, Shelly (Michael) Harvey, Jennifer (Kyle) Austin, 4 great grandchildren and many nieces and nephews. Visitation will be held at Moore Funeral Home in Wiggins, 1115 W. College Ave., on Tuesday, November 20, 2018 beginning at 6 p.m. Funeral will be Wednesday, November 21,2018 at 11:00 a.m. at the funeral home. Burial at Elder Ridge Cemetery. Bro. Keith Branch, Bro. Jessie Ladner and Bro. John Morrison will officiate the services. To send flowers or a remembrance gift to the family of Colon Berry, please visit our Tribute Store. "Email Address" would like to share the life celebration of Colon Berry. Click on the "link" to go to share a favorite memory or leave a condolence message for the family.